Minimum temp could be below -5°C from October 'thru March. December, January and February are the coldest months. Rest of the year, the minimum temperature would be 15-20°C. Manali is 570km from Delhi, the capital of India, and there are buses connecting the town with Delhi, Shimla, Dharamsala and Leh. For service from Delhi to Manali and back, tickets and reservations can be made at the Inter State Bus Terminus or the Himachal Tourism office on Safdar Hashmi Marg near Mandi House in New Delhi. You can book tickets online too. The approximate travel time from Delhi to Manali is 14 hours; from Ambala to Manali is 10 hours; from Chandigarh is 08 hours and from Kulu to Manali is 1.5 to 3 hours. Volvo buses—which depart around 17:00 and arrive about 10:00 the next day—are available from Delhi and is the best option in terms of comfort and value for money to reach Manali but you need to book these in advance. Some hotels like Snow Valley Resorts will book your Volvo & sightseeing along with their hotel package which results in a good package deal as you get everything in one go. The windows on Volvo buses are fixed and do not open at all. Carrying/ consuming a tablet for motion-sickness is advised before mountain journeys ('Avomin' is one popular brand available over-the-counter). Also heavy/ spicy meals just before/after boarding the bus should be avoided. Volvos offer bags that people may use if they feel like vomiting. You may enjoy a better view of the valley and the beautiful Beas river if you book seats on the right side of bus while travelling from Delhi. Bus Tickets for Himachal Road Transport Corporation can be booked online. This is one of the most popular bus companies to get to Manali and various other cities in the region. They have regular and deluxe volvo buses. Best part is the HRTC website accepts foreign credit cards so you can avoid the huge markups by ticket agents. Go to http://hrtc.gov.in/HRTCTickets/. While booking a private taxi for Manali, one must ensure that the driver has adequate experience driving in hilly regions and does not have the habit of drinking alcohol. Also make sure the driver has made the trip at least once before and knows all the routes well. Also, you need to make sure that the driver is habituated to long, continuous driving routines. If you are going to Manali through Chandigarh-Ropar-Kiratpur-Mandi highway, then your driver would need to drive on hilly roads for at least 6 hours. Chandigarh to Manali would be about 8-9 hours by taxi. The nearest Broad Gauge Rail Head is Ambala Cantt (200km) or Chandigarh (250km)from Indian Capital New Delhi. Ambala Cantt is on the Delhi - Amritsar and Delhi - Jammu main lines and is well served by rail, but you will need to travel to Ambala to get a bus for the 10 hour ride to Manali. Jogindernagar and Kalka are other, less preferable, rail heads for Manali. The nearest broad gauge station is Kiratpur Sahib in Punjab near the city of Nangal. It lies in Ropar district of Punjab. The station lies on the Ambala Cantt - Una route of Indian Railways. From here you can easily get buses for Manali. The nearest airport is Bhuntar ( Kullu ) Airport ( Tel: 01902-265037, 265603), 50km from Manali, 10km from Kullu, about two hours away. Air India Regional operate flights to Kullu from Delhi. However the services can be irregular, and airfares can be high. Himalyan Bulls offer flight services from Chandigarh to kullu airport. It can be booked from their site. From the airport the best option to go to Manali is by Pre Paid taxi which is easily available there. The taxi stand is 100 metres from the airport. They have written prices with minimum ₹1200 to Manali. Alternatively just go to Kullu and take a frequent public bus (₹35, see Get Around section). There are various ways of getting around in Manali, if you are not already travelling with your own vehicle. Most tourists hire a taxi (various kinds available), which takes you around to all the sight-seeing spots in and around Manali (Rohtang, Manikaran etc). It costs about ₹1,800 per day, or little over ₹3,000 if you book together for 3 days (in the peak season). Dress for Rohtang cost around ₹150 for each set including boots and skiing set will cost you around ₹200. These detail are mentioned at a board at Mall Road. Be sure to bargain. The second most common way is to hire a motorbike. There are many places where you can hire a motorbike (easy to find if you ask around), and is the most common mode of transport for foreigners. Both cruiser bikes like Bullet and sport bikes from Honda, Bajaj, Yamaha etc are easily available, though Bullet is the most commonly seen one on the roads. Rates hover around ₹1000-1500 per day in the peak season, but much discounted at other times. A good place worth a look will be in Bike rentals Manali office in Vashisht 9816044140, have a good selection of Royal Enfields and Pulsars. Also 'Tinku' Bike mechanic near old Manali bridge is an honest shop for bike rentals. Public transport is not so good. There are cheap bus services, but they are not so frequent. Yet, if you are going to stay for a long time, it is better to know the times and use them, as other modes of public transport are exorbitant compared to bus. For e.g., auto rickshaws take ₹200 from manali mall road to Solang valley, while the bus will cost you just ₹10. The buses are not punctual specially because they seem not have a written schedule. The best option is to ask about timing at the bus terminal. Buses starts to run at 07:00. Frequently a bus can be cancelled or late. You can get in / out almost at any place on the route just wave to the driver. Rohtang Pass, at an altitude of 3979m (13,050 ft) above sea level, is another adventure tourist site where it can be cold even on a summer day. It is the highest point on the Manali-Keylong road and provides a wide panoramic view of mountains rising far above clouds, which is truly breath taking. Close by is a small lake called Dassaur Lake. Beas Kund, the source of river Beas, is also nearby. In winter, the road of Rothang Pass is closed. Important to note that the road to Rohtang Pass is closed off at Manali bridge, on all Tuesdays 09:00-18:00 for carrying out road widening work and repairs. If you are able to leave early, before 09:00, you can avoid the traffic rush (found on all other days) and have Rohtang Pass to your self (well almost!!). Flip side is to be prepared for stoppages (extending up to a few hours) on the return trip as the road is blocked off where repair works are progressed. If you are driving up, be prepared for the rough broken roads at many places, sheer blind turns and tight hairpin bends, which can be exhilarating depending on the state of your nerves. If you are hiring a vehicle then better rent a four wheel drive vehicle from Manali. Some times the local people along with police does not allow the non-four wheel drive vehicles from going beyond Snow-Point(a place 16km before Rohtang Pass)and force to hire their own 4x4 vehicle at exorbitant prices which can be up to ₹1,500-2,000 per person. This happens in the winter times when there is heavy snow fall. The tours organized by HPTDC does not go up to Rohtang pass and terminate at Snow-Point. Shared taxis are also available. Rohtang Pass can also be accessed on foot, if there are stoppages beyond Snow-Point. However, it is a strenuous climb and also needs a good guide to show the short cut routes to the Pass. Beas Kund, an igloo shaped temple, on top has a spring which is the origin of River Beas. Hadimba Temple: It is an ancient cave temple dedicated to Hidimbi Devi, who was a character in the Indian epic, Mahābhārata. The temple is surrounded by a beautiful cedar forest (Dhungri Van Vihar) at the foot of the Himālayas. The sanctuary is built over a huge rock jutting out of the ground, which was worshipped as an image of the deity. The structure was built in the year 1553. If you're walking to the temple you can take a short cut up the hill through the woods instead of walking along the road. Look for two signs side by side with vertical Hindi writing on them (blue on the left, green on the right). Kalath Hot Water SpringsAround 6.5 Km downstream from Manali,natural sulfurous water flows from the bowels of earth.public bath areas and private bath areas are available. "Asia Sulphur hot water spring" is a small hotel where private bathroom can be hired on per-person basis(c. ₹100/person). These are simple bathrooms but give all the privacy needed by a couple or family.It can be easily spotted on your way to Manali just before the "Green Tax barrier". Vashist Hot Water Springs and Temple: Around 3km from Manali, across the Beas river is Vashist, a small village with natural sulphur springs. Modern bathhouses, with Turkish-style showers, have the hot water piped into them for the convenience of the visitors who come here to benefit from the medicinal properties. Vaishisht, also boasts a pair of old stone temples, opposite each other above the main square. Dedicated to the local patron saint Vashista, the smaller of the two opens on to a partially covered courtyard, and is adorned with elaborate woodcarvings. Those lining the interior of the shrine, blackened by years of oil-lamp and incense smoke, are particularly fine. The temple tanks are underground hot-water/sulfur springs. Be wary of hanging up your trousers or bags on the hooks provided, pickpocketing is a daily occurrence. Hand over your wallet to a trusted person for safekeeping before you enter the springs for a bath. Separate tanks for men and women are provided in the temple. Keep in mind these are open baths and little or no privacy is available for women except separated areas for bathing. Jogini Falls: About a 2km trek from Vashisth Temple. Going to the top of the falls would need a guide and quite a bit of trekking, but if you wish you could just keep asking for directions from Vashishth temple and reach the first level of the falls. Solang Valley popularly known as Snow Point, is 13 km northwest of Manali and famous for its 300m ski lift. The Ski Lift ticket is ₹500 per head for a trip both ways. It is a picturesque spot and offers splendid views of glaciers and the snow-capped mountains. Solang valley also offers attractions like paragliding, snorkeling etc. Jagatsukh, the former capital of Manali, is also an important spot. Jagatsukh: Jagatsukh, the former capital of Manali, has a few nice temples done in Shikhara style. You can visit them while travelling to Naggar. Rahala waterfalls: About 16km from Manali at the start of the climb to the Rohtang Pass, are the beautiful Rahalla Falls at an altitude of 2,501m. Old Manali: At a distance of 3km northwest of Manali is Old Manali, famous for its orchards and old guesthouses. Calm and serene surroundings coupled with the sound of Beas river is a very peaceful experience. There is ruined fort here by the name of Manaligarh. There is also the Manu Maharishi Temple, dedicated to sage Manu. 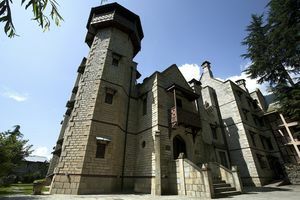 Naggar: The Castle, Roerich House and Art gallery are places to see. Moonlight dinner on the balcony of Hotel Castle restaurant is worth experiencing, with the lovely sight of twinkling lights below in the Beas valley. Bijli Mahadev temple, about 20km from Naggar, is also worth visiting. 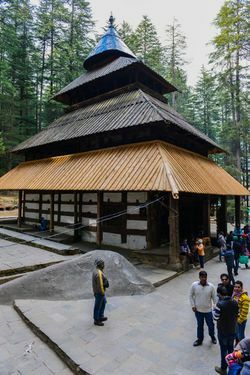 Krishna Temple at Thava: Ask for directions to this temple from Naggar Castle and do a small trek of half an hour through dense pine and deodar forest to reach the beautiful Krishna Temple. With hardly any tourists around, this place is magical. Jana Falls: 15km from Naggar and 35km from Manali, at Zana Village, beautiful Water Fall is worth visiting. The valley provides amazing views. There is one water fall on the road side and two other water falls which are not much explored by tourists and are amazing. Moreover Traditional Himachali food is available here at small hut like shops. Beautiful Log Hut Area: In fact both these places especially log hut area have some good hotels to stay. Hot natural Sulphur water bath at Kalath(6.5 Km downstream),Vashisht village (3 Km upstream) or Manikaran. Get your photos clicked with either rabbits or yaks (near the Hidimba Temple). It will cost about ₹10-20 (USD0.50) for a single photo. One can also enjoy paddle boating in a fun park near Hidimba temple. River rafting, skiing, zorbing, trekking, snow scootering, and river crossing. One of the best adventure companies is the High Himalayan Adventure, based in Vashisht village. River rafting is closed during the monsoon season, typically around August 15 to Sept 15. Check the dates if you are interested in doing this. Paragliding- A word of caution. Many pilots of these parachutes are un-trained and obtain licences in the usual way any licence is obtained in India. Many a tourist visit the Lady Willingdon Mission Hospital with broken bones, sometimes protruding out, and often alive, after accidents. Some paragliders crash into innocent bystanders who end up with spinal injuries (information added by a surgeon who worked at the mentioned hospital. These victims are often treated at the hospital. Serious and complicated cases with heavy blood loss are stabilised to the extent possible and refered to either Chandigarh or Shimla. Some sadly don't make it. Blood availability is very very limited in this hilly area. www.manalihospital.com). Paragliding is quite popular in Manali, especially in the peak season. 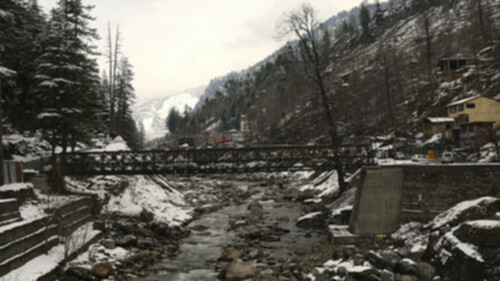 The scene is located at Solang Valley. There are multiple levels, starting from the basic 1 minute flying for Rs. 450 (the most common), progressing to a more fun 5 minute flight for Rs. 1500. But the ultimate is the half an hour flight for Rs. 2500, for which they take you up almost halfway to rohtang, and bring you back to solang all the way by paragliding. In such a long flight, wind plays a big role, and sometimes it is not possible to fly all the way to solang, something to keep in mind while going for it. Generally, later in the day you go for it, better are the chances you will do the whole flight.The trip to Hospital, though, may cost you much more than just money! Rock climbing- there are some fabulous routes, however, go with a reputable company that can provide you suitable gear, otherwise this can become a dangerous sport. Look for the bright orange building across from Pizza Olive. The company also does abseiling trips, in which you can swing down into 9 tiers of a waterfall using rock-climbing equipment. Another contact is Dave Morahan (9805346007) who takes you to all kind of rock climbing trips for all difficulty levels, and is quite skilled himself. If interested in books, there is a bookshop in the main town near the Post Office called Bookworm. It has a decent selection of books. Hiking- Take the steps behind Himalayan Extreme Centre in Old Manali and follow the footpaths to a beautiful 1-2hrs hike alongside the Manaslu river (much nicer than Yogini falls). You'll have to come back the same way. Swimming possible. Deo Tibba Base Camp Trek: This trek is a technical trekking trail in Manali. This trek is a famous trek among the experience climbers. This trek gives a magnificent view of Deo. 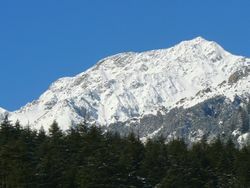 Friendship peak Trekking: This is one of the majestic mountains in the beautiful valley of Kullu. This mountain is situated at around 5289 meters above the sea level. Best way to go for this trek is from Beas Kund and Dhundi. Keychains, name plates, etc which are customized to ones own message are worth buying as mementos. Also one can get his name carved/written on a single grain of rice. One can also visit Manali Market to buy woolen stuff like sweaters, pull overs, shawls, blankets, etc. Hippie clothes/ jewelery can be found in Old Manali. Also one can buy personalized key chains made of woolen threads. Fruit products, honey and apricot oil at Himcoop Juice Bar Manali are also something local produced in the valley. Jam from Himcoop taste like real fruit due to high contents of fruit pulp and apricot oil is good for joint pains and also general massages. Chingu. Local shops are aplenty selling chingus ( a type of blanket) claiming to be warm in winters and cold in summers. Be wary of these. They will show you parcel ready chingus. Do not fall prey to them. The chingus are also known as "Sparu". Beware of these Sparu sellers. Do not buy saffron (kesar), musk (kasturi), or shilajit from street vendors; most of these products are fakes. Buy from government-authorized shops only. Do not also buy the dry fruits, almonds, cashews, and pistachios that they sell on the streets. They seem to be cheap but they are stale and not of good quality. Manali market is key place for eatables. Right from chat to Indian (veg/nonveg) to international cuisine like Italian/Chinese are available in the main market which is just opposite the Manali Bus stand. The mall road has a variety of eating options ranging from stalls and dhabas to fancy restaurants. Deeper into the lanes of the town, one can find more local eating places, catering to special tastes and habits ranging from Tibetan food, to Vaishnavi Dhabhas. You are sure to find something without hunting around too much. You must try the local cuisine while you are in Manali. Chilra is pancake made from fermented mix of jaggery and flour, and it it is eaten with a vegetable dish. Sidu is large steamed dumpling made filled with different types of mixes such walnut chutney, poppy seeds or grounded/ roasted sesame, and is eaten with Ghee or chutney. Bedhni rotis are parathas filled with a grounded mix of roasted sesame and jaggery. Excellent high energy food for treks. It is difficult to find these in Manali town. Your best bet to enjoy these is to visit Hamta village, which is just 12 km from Manali. Old Manali is one of the best places to hang out in the evening. It has a great collection of restaurants/bars and shops. It is also not crowded like the Mall Road, with the crowd consisting mostly of foreigners. You can get a nibble of Yak's cheese in the restaurant's here. The Lazy Dog has an extensive multi-cuisine menu, featuring an assortment from Korean, Japanese, Thai, Italian, Vietnamese, Continental and Indian Cuisine. The food is excellent and the ambiance is great. The restaurant sits on a sheer cliff right by the river Manalsu. With free wifi and gracious hosts, this is one of the favorite hang-outs in all of Manali. No wonder it is 'Highly Recommended' by all major guidebooks. Andhra Bojanalayam near Piccadilly theatre serves south Indian tiffins, full meals(Rs.150 per plate) and snacks. Morning 8am to 10pm. Very good. If you order full meals ask for extra "Kandhi Pappu Podi" and "Rasam". Pure Veg only. Bob Dylan's Cafe (also known as Roasted and Toasted) is in the heart of old Manali. It serves the most delicious cookies and sandwiches. With its extremely good menu and pocket friendly price, it remains one of the most popular destinations after a day's sightseeing. Also, at no extra cost you have a very comfortable movie theater where you can choose among some 100 movie titles and watch as you munch on those delicious cookies. And yes, they do play Bob Dylan's songs. Must visit. Shere Punjab Serves good butter chicken with butter naan. You can also get a beer which is not mentioned in the menu, if you ask for. Blue Elephant Cafe is a small eatery with good Indian and Western spread at very reasonable rates close to the bridge on Beas river. You get the option of sitting and enjoying the food right next to the river gushing by. Try out the freshly made parathas, bruschettas, omelettes and traditional Indian tea. Pizza Olive has the best pizza in town and is worth the trek to Old Manali. Also try the fabulous tiramisu. Green Forest cafe, lying on the Hadimba-temple old manali road, only a few hundred meters from the temple, is also a very popular destination for both locals and foreigners. It serves tibetean soups, veggie dumplings and other sandwiches and snacks. Moondance is right opposite the Dylan's cafe. It also has a multi-cuisine menu, and the food and ambience are all good. Apple Blossoms at Manali Heights Resort (near log huts area) to savour the best of local himachali menu as well as delectable Indian, european, oriental cuisines. Johnson's Bar and cafe located 5 minutes walk up from the mall road, it is a great place to hangout in the evening. The food and service is quite good, and is thus a very popular place. Chopsticks (opposite the bus stand).Really good Tibetan food. Mayur Restaurant (in a lane opposite the upper end of the bus stand). Vaishnao dhaba (in the market adjacent to the bus stand). Valley View Restaurant at Snow Valley Resorts (known for beautiful view and good homely buffet food). Local Himachali Dish-Sidu is right at the tea shop behind bus stand in municipal market. One can eat Sidu (which is like filled Idli or filled rice baked bun) with Chutney to experience a slice of Himachali Cuisine in Manali with tea/black tea/coffee. This is the only 1 there is visible yet hidden but worth a gem before leaving Himachal. The locals drink two kinds of alcoholic beverages: Lungdi (plains) or Chang (Himalayan), a kind of crude beer made from fermented rice or barley and Sharab (plains) or Arak (Himalayan), an alcoholic drink distilled from Lugdi/chang. Arak can also be made from jaggery or apples or any other fruit. You can enjoy these drinks in Hamta village, 12 kms from Manali. It might be an interesting experience to visit a local home when the ladies make arak (quite regularly). You can sit in the fields where the ladies make it, have hot water from the distilling to wash with and "test" the product at frequent intervals. Because there are apple orchards all around Manali, it's often possible to find apple cider. Besides this, there is alcohol available in bars, larger restaurants and the larger hotels. Kullu-Manali Valley is known as fruit bowl of India. Himcoop Juice Bar at The Mall Manali is one of the well know corner shop since 1972 selling 100% Natural Apple Juice and fruit drinks made from local fruits besides some syrups known as Fruit Crush to carry home to prepare fruit drinks after diluting with fresh water. Himcoop Juice Bar is located on the Main Mall as one of the corner shop next to Temple. Blue Guest House, Castle Road Naggar, Brahman Kothi, Naggar, Kullu Manali, +91-9817287347, +91-9816421109 (Mrs. Lata Sharma), +91-9816377076 (Mr Chander Shekhar Sharma), Hot water, CTV, view of Kullu Valley and Beas River and roof-top restaurant. This is a family run guest house and the couple is very courteous. The guest house is priced between 200/- and 500/- per night and located on the way up, about 0.5 kms before the Castle. Manali is 30 mins by local bus. Snow Valley Resorts , Log Hut Area, +91 1902 253 228, 253-027, 098160-03027 (24 Hrs) E-mail: [email protected] . This is a handsome place sprawled over the most posh area in Manali log hut area and is surrounded by apple orchards and deodar forest . The hotel has ample of open space comprising lush green lawns , open air terrace etc . All rooms are tastefully decorated with moderen facilities and offer fabulous view of lush green apple orchards and mountains. Silmog Garden , Near Mall Road Manali, +91 1902 252862, 094182-05147 (24 Hrs) E-mail: [email protected] . For Families and Couple with Homely food and comfort. Hotel has facilities like Wifi Internet access, Power Back, Restaurants, Television, Credit card , 24hours Hot water with Solar Heated Water Backup, Parking. Himachal Cottage Villa, Village Bashkola, Kullu-Manali, +91-9417150502 Email:[email protected] Website: Set of three cottages near orchards. Himkund Cottages Rangri. 09817094200, A collection of three cottages 2-3 rooms in each cottage, which are well decorated. Honeymoon Inn, Left Bank, [email protected] 59-room hotel with extensive lawns and indoor facilities. Manali Heights, Log Hut Area, 9316101103 E-mail: [email protected], Manali Heights is a resort set near the Dhungiri forest, amidst ancient Deodars. Shingar Regency,, +91 09816921378 . 44 rooms, walking distance from the main market, in very pristine surroundings around Hadimba Temple. Mapple The River Crescent Resort 09816921378 E Mail:[email protected] URL  Manali's latest 4 star addition situated at Rangree on banks of the River Beas. 50 AC rooms, centrally heated with all amenities. Johnson Lodge Tastefully done up property with a popular Bar and Restaurant., 01902-251523, rooms @ Rs 4000. Tree House Cottages, Village Jong, Katrain, Dist. Kullu (H.P. ), +91-1902-240365, +91-98160-78765, [email protected], . The Himalayan - Castle resort in Manali. http://www.thehimalayan.com Email: [email protected] Telephone: +91 1902-250999/250777, 8894005999 The Himalayan is an exclusive boutique resort located 1.5 kms. from Manali town centre on Hadimba Road. Tucked away amidst an apple & cherry orchard are 8 luxurious guest rooms in the Gothic Revival style Castle (all with four-poster beds & antique armoires) and 8 cottages (each with 2 Bedrooms complete with en-suite bathrooms, dining & drawing space with working fire place). All cottages have their own private gardens, balconies & mountain views. Conference, Bar, Restaurant & In-room dining is available. Gymnasium, Croquet, Trampoline & Table Tennis provided. Refectory restaurant serves Continental & Indian cuisine. The Dungeon bar is atmospheric with pews & chesterfields. The Forge Boardroom is fully equipped for Conferences/ Offsite Meetings. Manali's only al-fresco Swimming Pool is open to Non-residents at a charge. Quiet understated luxury with stellar views. Nature Treat Hut +91 9816056934 E Mail:[email protected] URL  Nature treat hut is situated 6kms south of Manali. Place called Jagat Sukh a small Village with Traditional Wooden Houses of Himachal Pradesh also near to Gayathri Temple which is one among two temples in India. It is surrounded by Apple orchard and wide view of Himalayan mountain range. It is far from crowd and in the lap of Peacefull Nature and the kullu local food can be tasted. Walking on the streets up to 10:00 PM is usually safe for women but avoid going into small lanes and by-lanes after it is dark and make sure that you are not wearing any jewelry while walking on the streets. Travelling northward from Manali is the breathtaking region of Lahaul and Spiti across the Rohtang Pass. The "highway" crosses the pass and forks at Gramphoo (12km) the left one goes to Lahaul and is the Manali Leh highway and the road on the right leads to Spiti via Kunzum La. The Rohtang pass also marks the boundary between the fertile Kullu valley with its lush greenery and the sparse vegetation Lahaul and Spiti. The Ladakh, Zanskar and Changthang areas further on are even more barren.Contact wetrekkers. This page was last edited on 9 April 2019, at 13:25.